Would you like to know how much Larry David paid for rent in 1977? 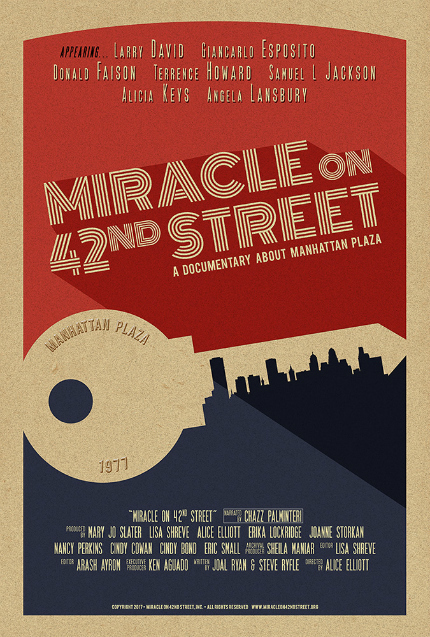 In our exclusive clip from Miracle on 42nd Street, the manager of an apartment complex and multiple residents, including a few celebrities like Larry David (Curb Your Enthusiasm), talk about the place they called home. Alice Elliott's documentary tells "the untold history and impact of the Manhattan Plaza apartment complex in New York City," according to the official synopsis. "Starting with the background of the blighted Hell's Kitchen neighborhood and the building's initial commercial failure in the mid-1970s, the story recounts how - in a moment of bold inspiration or maybe desperation - the buildings were 're-purposed' as subsidized housing for people who worked in the performing arts, becoming one of the first intentional, government supported, affordable housing for artist residences. "The social experiment was a resounding success in the lives of the tenants, and it led the way in the transformation of the midtown neighborhood, the Broadway theater district and local economy. The film makes a compelling case for the economic value of the arts and artists in America. The success of Manhattan Plaza has become a role model for similar experiments, which the film features, around the country, in places like Ajo, Arizona, Providence, Rhode Island and Rahway, New Jersey." Narrated by actor/writer Chazz Palminteri, Miracle on 42nd Street "features on-camera interviews with people whose lives were positively impacted by the complex, including Alicia Keys, Terrence Howard, Donald Faison, Larry David and Samuel L Jackson, Angela Lansbury, Giancarlo Esposito, and many others." It all sounds mighty impressive, and, judging by the clip, it's tartly edited and calls back to a different era of the city that never sleeps. The film will enjoy its world premiere at DOC NYC 2017 on Saturday, November 11. More information is available at the film's official site. Have a look at our clip below, won't you?